Maya is a 9 year old girl who loves to play soccer. Maya's mother is a jewelry maker who often reuses things like soda cans and bottle caps to make bracelets and necklaces. Because of her mother's job, Maya learned the importance of the 3Rs. When she learned about the Ecokids from Wheeler, she joined right away. 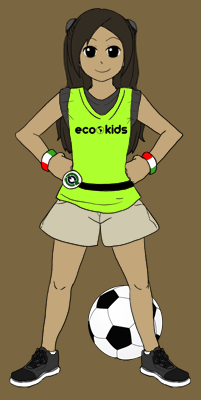 Maya often cleans up litter around the soccer field and uses the trash to make wristbands for her friends.